If you happen to be one of those who still believe the mtn starter pack or the Etisalat 500% package offer are the best tariff plans available at the moment, then you might want to brace yourself for this new tariff plan from Glo known as the Glo Jollific8. 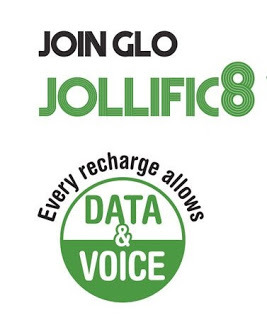 With this new Glo jollific8 tariff plan, you will get 800% percent bonus on every Recharge to call all network. Aside that, you also get free data to browse the internet which is also valid for at least 7 days. One of the coolest thing about this tariff plan Is that you can call any network with your bonus airtime and you can also share your free data among your family and friends who are also on the Glo network. How cool is that!? Below is a more detailed breakdown on how this plan works. With N200 recharge, you get N1,600 airtime + N100(25MB to gift)=N1,700 valid for 7days. With N500 recharge, you get N4,000 + N200 (50MB to gift) =N4,200 valid for 15days. With N1,000 recharge, you get N8,000 +N400 (100MB to gift)=N8,400 valid for 15days. With N5,000 recharge, you get N40,000 + N2k (500MB to gift)=N42,000 valid for 30days. How To Enjoy The Glo Jollification Tariff Plan. ==> Get a new Glo Sim. ==> Register your new sim card and you will be automatically migrated to this plan upon activation. ==> Whenever you want to recharge your line, just dial *123*recharge pin# and you will be rewarded with 800% of your Recharge and also free data. ==> To check your jollific8 bonus, just dial *122#. As I said earlier, you can also gift out this free data. To do so just dial *106# and follow the instructions. It's not too late to join in this new Glo fiesta, just get a new sim and follow the above instructions to get started. If you have any question, feel free to drop it in the comment box below and also don't forget to share this post among your friends. The boss sorry for bothering am trying to reach u concering infinix x507 brisk issues. Seem a while u looked at the comments from that post.